Tony Atkinson spent his early days suspended in a cage outside the sixth-storey window of his family home in 1920s London, so perhaps he was always going to see the world differently. This is a gloriously entertaining memoir of a life fully lived in and around ridiculous, hilarious situations. There was the time Tony came between Winston Churchill and his bowel movements (an accident that required a parliamentary explanation); and when Tony and his friends rerouted the London bus network so they could race Stirling Moss around the city; and the high-society shenanigans he witnessed after becoming footman to Queen Elizabeth – all just tasters from this irresistibly charming memoir. Tony and the love of his life came to Australia as ‘ten-pound Poms’ and although he eventually settled into a medical career, one would never really say he settled down. His speciality was anaesthesia, but his greatest gift may be for telling rousing tales. 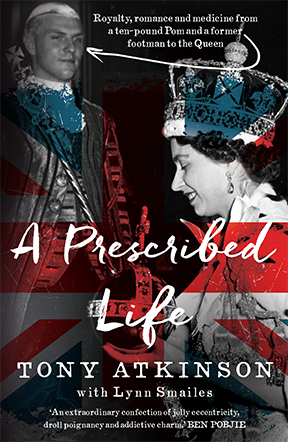 A Prescribed Life is a warm and engaging chronicle about love, medicine and royalty spanning almost a century of great change.